Cavechat.org • View topic - Leaving harness in cave? I'm curious about the dangers of leaving a set of vertical gear in a cave for a year long project. We have a new lead that requires a nuisance climb of about 20 feet but it takes 2-4 hours to get to the climb depending on the group. We are getting ready to survey it and I'd like to avoid hauling all my gear back and forth. Are there any tricks to make sure the gear doesn't deteriorate due to moisture or cave mold? P.S. It's actually a really old lead (signature circa late 1960's) but was recently dug open by a fellow caver to go further than it used to. Re: Leaving harness in cave? I wouldn't leave a harness underground. Have you considered just leaving a wire ladder and lifeline in situ? A cable ladder would awesome. Don't forget that ziploc makes some very LARGE bags. I am thinking that wrapping my gear in two kitchen trash bags, placed inside of a large ziploc, would keep the gear just find assuming you are NOT in a flood prone area. I used those big Zip Lock bags on a canoe trip this summer. They can't be trusted. They are thin and flimsy. The zip is not strong. Look at them funny and they pop open. Probably great for storing stuff in the attic, but for outdoor use, I don't recommend. I don't see a problem with leaving a harness for a reasonable amount of time. Moisture and a little mold won't hurt nylon too bad. The biggest risk might be inspection. If it gets muddy, it may be difficult to clean it enough to inspect. I would just leave it hanging where the air can circulate around it. And make sure there are no pack rats or mice running around looking for nesting material. I don't want to put it in plastic. That can actually make mold and rust worse if the gear gets muddy before going in the bag. Looks like it may be better to use a lite SRT system. Lifeline is currently there. Don't have a wire ladder. I also haven't been up this climb yet. The lead part of the team has done it. We are still at least 1 day of re-survey (adding clino readings) before we can get into this and start pushing. Their push to find new leads in a very old part of the cave is driving the re-survey. I'm just trying to get ready for some long trips. I'd go with the prusik knots, webbing harness and some carabiners also. Drybag with a generous amount of silica gel packets thrown in? You will need a lightweight harness one way or the other. An Alpine style SRT approach, for small groups, sounds logical. I think you still need to find out the potential for more leads in this new area, and then how many people will be bottlenecked at this nuisance drop. For a few trips with a few people, I would go with lightweight Alpine SRT. If you are planning numerous exploration and survey trips with a crowd of folks, then I would look into using a cable ladder with a self-belay system. Using the right technique, I would think that you will move more people through the short climb more quickly using a cable ladder. You have already spent a lot of time getting there (and then back out afterwards), so consider what might be the most efficient means to move your people through the cave. Gotcha. Guess we need to consider throughput if the passage keeps going. I think I need to make sure a survey gets in there in the next month. Photos and recap would be awesome. 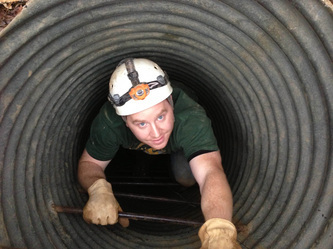 Old school cavers exploring the long caves of TN would often do things like drag lumber in and build a ladder. That way they never had to carry SRT gear in (at least until the latter rots). About the harness though, I wouldn't mind leaving mine in a cave for a while, depending on two factors: how fast metal buckles on the harness rust in the particular cave you are in and how aggressive the pack rats are. Alpine SRT really just slows everything down and waste way more energy in most non-alpine caves. The best practice is to use what works for the particular cave you are in and don't do something just because it looks cool in the international cave photos (unless that's one of your goals). We're considering a cable ladder. Lumber would be hard. It's well over a mile into the cave. And most of it is crawling/sporting. If the lead goes far we will re-consider ladder options.